Be the first to share your favorite memory, photo or story of Darla. This memorial page is dedicated for family, friends and future generations to celebrate the life of their loved one. 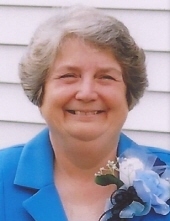 Darla Jean Perkins, age 72, of Ava, Ohio, died Saturday, March 16, 2019, at her home. She was born March 5, 1947, in Cambridge, daughter of Alice Jean Dudley McCall Bond of Ava and the late Ernest F. McCall. She was a 1965 graduate of Shenandoah High School and she was a homemaker. Darla was a member of the Ava Free Methodist Church and she was a devoted Christian who loved the Lord. She enjoyed flower gardening and loved being around children. She loved her daughters and her grandsons, and she was devoted to her family. In addition to her father, she was preceded in death by her step-father, Clyde H. “Junior” Bond; and one granddaughter, Kaitlyn Nicole Malhiet. Surviving in addition to her mother are her husband, James Wilbur Perkins, whom she married November 24, 1982; two daughters, Dawnetta (Chad) Carter and Lavonda (Michael) Malhiet, all of Ava; two grandsons, Phillip James Malhiet and Cody Allen Malhiet, both of Ava; two sisters, Sandra (Fred) Perkins of New Johnsonville, Tennessee, and Gladys Jane Hogan of Lore City; her mother-in-law, Dorothy M. “Dottie” Perkins of Ava; and several nieces and nephews. Friends may call Friday, March 22, 2019, from 2-8PM at McVay-Perkins Funeral Home, 416 East Street, Caldwell, where the funeral service will be observed Saturday, March 23rd at 11AM with Pastor Rodney Reeves officiating. Burial will follow at Halley’s Ridge Cemetery. Memorial contributions may be made to the Huntington’s Disease Foundation at www.huntingtonsdiseasefoundation.org or to P.O. Box 912, Salado, Texas, 76571. To plant a tree in memory of Darla Jean Perkins, please visit our Tribute Store. "Email Address" would like to share the life celebration of Darla Jean Perkins. Click on the "link" to go to share a favorite memory or leave a condolence message for the family.